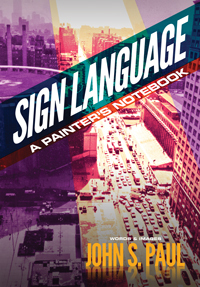 SIGN LANGUAGE: A PAINTER’S NOTEBOOK pays homage to the lost art of urban outdoor sign painting, in photos, drawings and words. In a working environment both novel and ambitious, Paul found success, noting “No other job gave me such a direct impact on the urban landscape, or such physical engagement. Painting signs over Broadway in 1984 was a rare look down from the elevated height of a heroic messenger.” Poetry and the lost art of sign painting collide in this debut book by New York painter/poet (and part-time street artist) John S. Paul. A mashup of angular skylines, unusual people and unique pockets of the world’s greatest city, woven with poems detailing the danger, fear, and freedom in soaring heights. Few books have ever provided such an insider perspective into this lost art. In 40 photos and 30 poems and stories, the author creates an immersion into a rarified world of danger and beauty, that raises the sense of the importance of moments, and blurs the boundary between public and private space. Enthralling and thoroughly engrossing, SIGN LANGUAGE is also a memoir of the desperate measures one artist took to remain committed to his creative side and still provide for his family, despite the perils of the profession. Beautifully conceived and designed, it is of interest to both admirers of photography and poetry, as well as fans of the cityscape. A “High Line Park” in print. John S. Paul came to New York City in 1972 from Chicago, and is still Midwestern at heart. He studied at Washington University, St. Louis, where emphasis was placed on craft, grounded in the canons of German expressionism and the Bauhaus. He went on to Yale for an MFA, where modernism was key. Later, in San Francisco, he attached himself to a drawing group with Elmer Bischoff, Joan Brown, and George Lloyd, where he focused on mural sized landscapes of California scenery. Relocating to New York, he turned to portrait and simple genre painting: still life, interior, bathed in the beautiful New York light that Matisse spoke about. He associated with fellow downtown artists Fairfield Porter, Alex Katz, and Larry Rivers, and shared a loft with Ilya Bolotowsky. In the eighties John Paul worked in the novelty world of outdoor advertising, billboards and wall signs. This job exposed him to a different, sharper and more practical kind of talent and craft and took his eye to crazy heights, gothic viewpoints of skewed angles and verticality. And danger. These “danger” moments sharpened his eye as the observer, and trained him to be on the lookout for beauty. Today, he devotes himself full time to art and writing. He lives in Brooklyn, NY. More information is available on his website www.johnpaulpaintings.com.